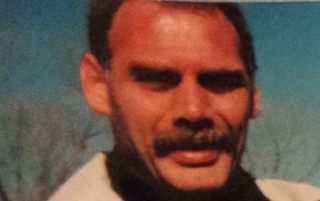 John Andrew Main (Pavlik)age 55, Air Force Veteran, went to be with the Lord on January 19, 2015. Married to Donna Main for 25 years, father of Melissa and Michael Main of Berkley, Massachusetts, grandfather (oompah) to Sophie, son of Myron and the late Shirley A. Mann, brother of Patricia, Cheryl, Susan, Linda, Nancy, Tim, Jeff, Andy, Phil and Nancy (deceased), beloved uncle of 18, cousin of many. Johnny loved fishing, loved children, camping and spending time with family. Memorial Service to be held at a later date in Berkley, Massachusetts. Donations to the John A. Main Memorial Fund can be made through any Chase Bank under the name of Cheryl L. Baker, Berea, Ohio. We fought like brothers and sisters fought, but deep down I know you loved me, and I loved you. I miss you so much. You left us too soon, Johnny. To Cheryl and John’s family my deepest sympathy at your loss. Prayers for your family during this difficult time. Melissa, Mike, Donna, We had just seen John a few months ago when he visited Chester Ave. He was so excited about seeing his old neighbors, like always, he ran from house to house making sure he said hello to everyone. I will always remember how he wouldn’t stay still, fishing, playing with the kids, working in the yard, Chester Avenue won’t be the same without John. We are so sad for your loss, you are in our thoughts and prayers. Rest in Peace John, I remember you for your love of the outdoors and Boating and Fishing. Your love for kids and all the Easter Eggs Hunts we had at your house. Many Holiday Dinners. God Bless, You will be sadly missed. I’m so sorry for the loss of your Brother John. the deep pain I know your going through. Our thoughts and prayers to Melissa, Mike, Sophie and Donna. So sorry for your loss. I am so sorry for your loss. I will miss him greatly. He always talked about Sophie and showed me her pictures. He really missed and loved her. I guess now I will have to do my own shoveling and carry my own garbage can back. But I believe he is in a much happier place now. God Bless !!! Johnny you were taken away way too soon. You will never be forgotten. You were loved by so many children and they will never get to know you as they grow older. I am so saddened on your early time to be with the Lord. I know you are in a better place but we you will be missed by so many. I have gained another angel to watch over the little children that you were a “magician” to. Please watch over them and be sure that they are on the right patch. Please watch over the family. Love you. I will be miss and think of you daily. John,,,,will miss you and our phone chats. I know everyone here will miss you but you are with your Mom, and Grandma and Grandpa. Love you, bud. What can I say to my baby brother. I can’t even tell you how much I miss you. It’s just not the same without you. It helps a little knowing your free and happy now. Until we meet again. Love you brother. My deepest sympathy on the loss of your brother John. I understand your sorrow and pain and pray that God will grant you peace in this journey of grief. God’s blessings to each of you.